Autumn House opened its doors in the fall of 1997. At Autumn House, we see ourselves as an extension of your family. This philosophy of care is reflected in every decision made for each resident. Families are the vital link to the resident’s past, and are involved with the program of care at all times. 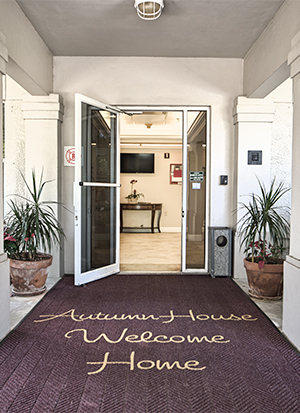 With a high staff-to-resident ratio of health care professionals, Autumn House residents are supervised and assisted 24 hours daily by licensed personnel. Our community focuses on preserving resident dignity by encouraging supervised participation in daily living such as light housekeeping, exercise and recreational activities. Staff members work hard to understand the background, personality and interests of each resident. We find this helps them feel as comfortable as possible in their new home. We believe that silent companionship, a warm hug, a touch, and the ability to listen can be more powerful than any spoken word. What sets Autumn House apart from other types of assisted living housing is the comprehensive facility design. The Autumn House design won national recognition by the American Association of Homes and Services for the Aging. The community is comprised of four households, each individually designed to increase comfort, safety and aid in residents’ orientation. From the layout to color schemes, traffic patterns to living areas, our community offers a positive alternative to other care arrangements. Each resident’s suite is individually set up to meet their physical, emotional, cognitive and spiritual needs. Warm inviting lighting, windows and space for personal items and decorations help to make each room a home with a heart. Four separate sitting and dining rooms promote socialization in a home-like environment. We promote freedom of movement. Autumn House’s five-acre campus is complete with beautifully landscaped, secure spacious gardens and walking paths. Our structured walking paths both inside and out encourage resident movement throughout the day. The open design, including courtyard garden, reduces stress, promotes therapeutic activity and encourages the walking that helps those residents with their need for movement, all within a safe and secure environment without feeling restrictive. Independent Living for Active Seniors.